You are currently browsing articles tagged yogurt. Kefir is a fermented milk beverage similar to yogurt that’s easy to make and has unique health benefits. 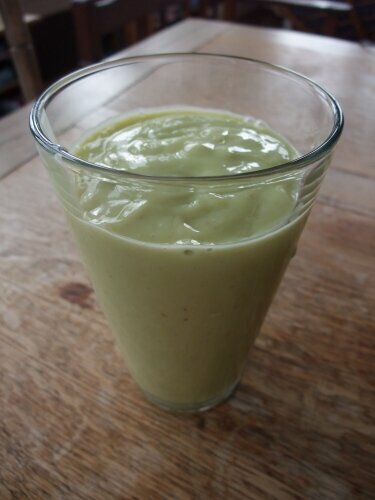 It’s thinner than yogurt and I like to use it to make smoothies, like this one flavored with avocado and dates. 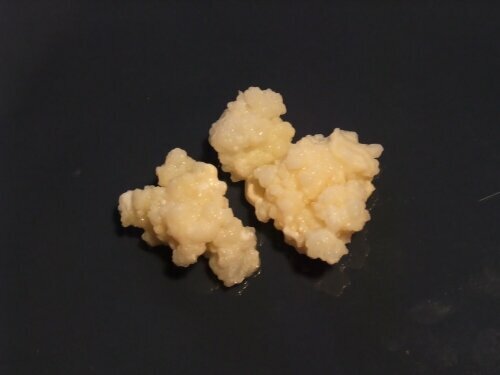 Unlike yogurt, kefir is the product of a colony of bacteria and yeast called “kefir grains” that is squishy to the touch and looks a little like a cauliflower floret. In this post I’ll tell you how to use it to make kefir. Here are the grains, rinsed clean. As long as it’s fed some kind of milk (or even sweetened water) regularly, the culture will grow and live indefinitely. The culture will also produce kefiran, a substance that thickens the milk somewhat. The bacteria and yeast use it to build the grains, and it has been shown to have beneficial antimicrobial and healing effects. The longer you let the culture sit in the same milk, the sourer it will become. I like to leave it for two days, and sometimes forget it for three or more. If it becomes too sour, you can add a sweeter or you can mix it with fresh milk before eating. As the culture grows larger it will put out more kefiran. When you have more than 1 tablespoon of grains per cup of milk, the kefir yogurt can become slimy and unappetizing. At that point you can either start feeding your culture more milk at a time, or you can split the grains and give them away, compost them, or eat them, which is perfectly safe. Once the kefir is the flavor and consistency you like, pour it through a plastic strainer to separate it from the grains. I find it helps to gently stir with a wooden spoon to break it up and help it fall away from the grains. Pour the kefir into a new jar and store it in the fridge until you’re ready to eat it. Put the grains back in the empty jar and feed them fresh milk to start the fermentation process over again. Don’t worry about the kefir that sticks to the sides and the bottom of the jar—it will help inoculate the new milk. If you’re not ready to eat 2 cups of kefir a day, you can let the grains get accustomed to the milk for half or even a full day and then put the jar into the fridge. The cold will slow the fermentation down and the grains will keep for as long as a month or two. Any longer than that and I like to take out the grains and feed them fresh milk. Which probiotics will help you? An article in yesterday’s New York Times raises the question, are probiotics just hype? The answer, according to the article, is no. But the author points out that there are many kinds of potentially beneficial bacteria in unpasteurized fermented foods such as yogurt, and not all of them are beneficial in the same way. Indeed, even a particular bacterium has different strains that may or may not offer particular health boosts. How are you supposed to know which probiotics are helpful and which aren’t? The author recommends searching the abstracts of studies at PubMed.gov, which can be both enlightening and confusing. It would be nice to have a source or a number of sources that gather scientific data together into a kind of guide to probiotics. Does anybody out there know of any? Meanwhile, I’m not about to stop eating live foods just because each and every bacteria that populate them has yet to be profiled. 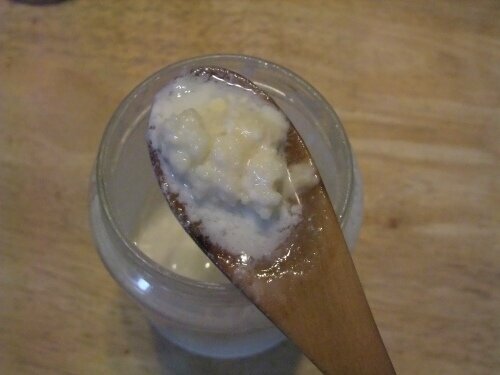 Eating yogurt or homemade kefir daily, along with turmeric paste, has helped me stop heartburn. More on how to do that later! Up above are my kefir grains, a little colony of bacteria and yeast that turn milk into kefir yogurt for me. 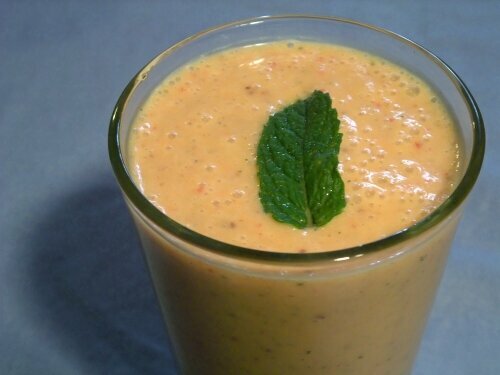 And a strawberry-melon-mint kefir shake like the one below is a particularly tasty way to get a stomach full of helpful probiotics. There are some more specific serving suggestions and recipes in there, plus some great info about what causes milk to harden up as it turns into yogurt. Check it out!